Fantastic book, one of the best I've ever read. It's scholarly, yes (with 182 pages of bibliography, notes, and index); it's largely a sourcebook, a series of huge verbatim block quotes, sometimes several pages long, excerpted from the original historical documents, written by the principle characters, strung along together into a narrative. But it reads like fascinating page-turner of a novel, almost a gossipy soap-opera. I could not stop reading it, and now that it's over, I miss it. I almost want to read it all over again. Of course, that's not the point of the book at all - just the opposite. Wolfgang Eckhardt's central thesis is that the split in the International Workingmen's Association was not simply a personal conflict between two titanic personalities, Karl Marx and Mikhail Bakunin, but a complex political struggle among many different factions, vying over serious questions of internal organization and policy, including, most importantly, the question of whether to form national political parties and participate in democratic, parliamentary elections (Marx said yes, Bakunin said no; but there were many complex shades and nuances to this question, and many positions taken by different federations and individuals within the IWMA). But along the way, the story gets so juicy that you can't helped being sucked into the drama of it all. Long story short, there are some pretty shady aspects of both sides. Both were scheming, in a fairly machiavellian way, against each other. And there were third parties, like the notorious Becker, who were playing both sides off of each other for their own purposes. In addition, nationalistic feelings and ethnic tensions entered into the conflict - and Bakunin notoriously resorted to anti-Semitism. But there's no question that the vast majority of bad behavior here is on the side of Marx, Engels, and the partisans of the General Council, who committed one act of slimy dishonesty after another... until the whole thing blew up in their faces. I cannot recommend this book highly enough. It is as philosophically enriching as it is addictive to read. 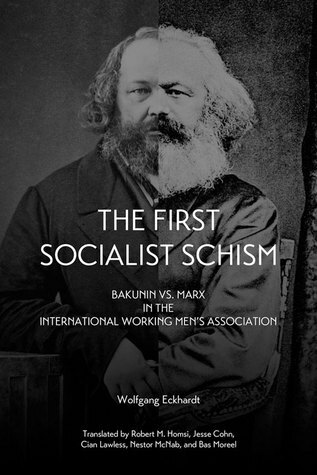 Sign into Goodreads to see if any of your friends have read The First Socialist Schism.